Uniformity by Blacksand Genève is a new contemporary timepiece at the crossroads between pristine watchmaking traditions and a minimalist style that reveals its full potential through powerful aesthetic references. This timepiece represents a new trend resolutely geared towards thoroughbred authenticity. Immediately recognizable with its urbane yet sporty appearance, the Uniformity model asserts itself through the curves that reveal a case framed by two sand-blasted matt ceramic shafts that shape the lugs while accentuating the combination of materials. Expressing total harmony, these geometrical proportions are the Blacksand style signature and house a finely crafted movement that is certified by the COSC and by Chronofiable. The open caseback, protected by a sapphire crystal, beckons the eye to appreciate the authenticity in motion of a self-winding twin-barrel movement beating steadily at the pace of 28,800 vibrations per hour throughout its 120-hour power-reserve. The hour, minute, seconds and date functions are displayed on an elegant dial, featuring hands, numerals and hour-markers that brighten up the dark night with a shimmering opaline blue glint, ensuring maximum readability and visual magic. Uniformity offers a fascinating demonstration of aesthetic differentiation, bringing to the stage the authentic spirit of the Blacksand brand that combines traditional know-how with an unequivocally contemporary approach conjugating both tenses: a modern present and a classic future. The case measuring 46 mm in diameter with a 23 mm interlug width is available in grade 5 titanium, tantalum, 5N gold or sand-blasted matt ceramic. The screw-in open caseback is constituted of a threaded ring in order to keep the engravings firmly in the correct position and sapphire crystal featuring an invisible marking revealed under heat. The screw-down crown with its matt ceramic insert and cap guarantees water-resistant up to 100 metres. The two-level dial with its opaline base and straight satin-brushed upper plate is available in black, black gold or white, with a choice of rhodium treated hour-markers with blue-emission Superluminova or Arabic numerals made of composite Superluminova in high relief. Hands with original Blacksand identity codes: satin-brushed or polished and coated with a matt varnish according to the “épargne” protective process. Interchangeable straps in HNBR technical rubber or alligator skin fitted with a triple-blade folding clasp completed with ceramic-capped personalized pushers. 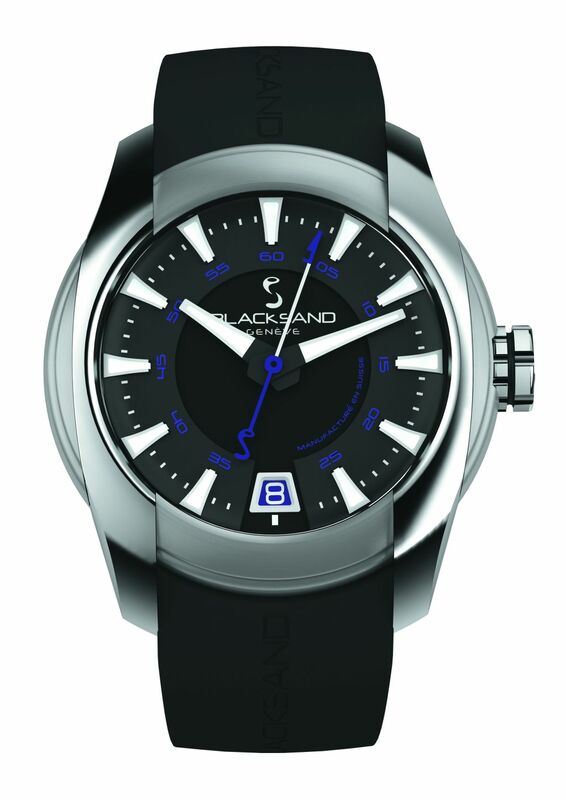 Blacksand Genève Calibre 1970. 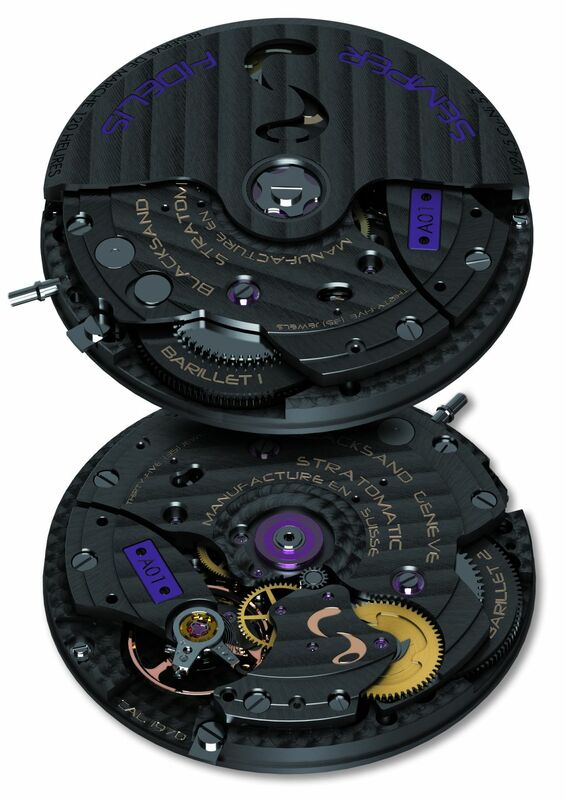 Self-winding twin-barrel movement 13 ¼ lignes, certified by the COSC (Swiss Official Chronometer Testing Institute) and Chronofiable, Technotime base calibre with the following characteristics: instant date jump, stop seconds, one-way automatic winding, 120-hour (5-day) power-reserve, 35 jewels, 28,800 vibrations per hour (4 Hz). 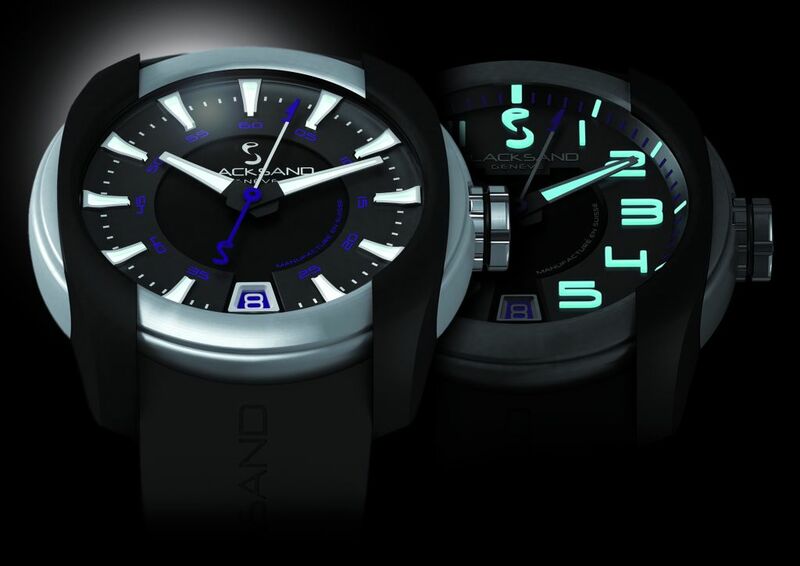 The tungsten carbide rotor features an exclusive ruthenium decoration and a pierced Blacksand logo.